Nico age 20 months, GSD X Malamute – Male, Neutered. Vaccinated, Micro-chipped. House trained, sleep’s in large cage (provided) Good with children, has lived with other dogs & cats. 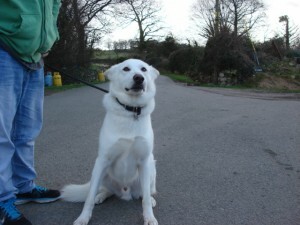 Large friendly dog who love company of humans, so needs a home with a new owner at home most of the time. We have lots of information on this wonderful pet, so contact us for more information or email the re-homing application on the web site or complete the form at the rescue.